2. Place the bags about 1-1.5m apart for maximum lighting effect. 3. Place a candle into the center of the pile, pushing it down into the soil so it is positioned upright and straight. You can use heavy-duty tea light candle or a votive candle. 4. Light the candles using either a large BBQ match or a grill lighter. Smaller matches will be difficult to use and will take quite some time if you have a number of candles to light. 5. Extinguish the candle once you have finished the event. 6. Luminary Bags is Flame-retardant, butNOT waterproof!! 7. 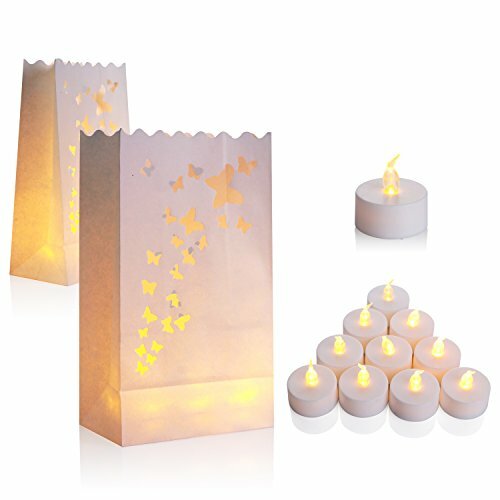 If you want to enhance the brightness of the candle bags, just put one or two more candles into the bags. 8. If you use open fire to light up the luminary bag, please be away from kids, animals and strong wind. 1.Simply switch on / off on the bottom to control the LED candle light..
2.The electric fake tea lights come with batteries which have 60+ hours of light-time and can be replaced easily via the tab at the bottom. Replace for CR2032battery. Our product has 100% satisfaction guaranty!!! If you have any question, please contact us for help. Create Ambience In Seconds - These flameless tea lights are the safe, convenient alternative to candles. Had a busy day or just don't want to deal with the hassle of candles? Simply switch these tea lights on and unwind in the warmth and ambiance of flickering candlelight for over 80 hours. Transform Any Space Into An Inviting Atmosphere - When lit, the patterned silhouettes create a unique candlelit environment. Each set includes 50 Luminaries with a special cut-out, making these candles the shape of the show - whether inside or outside, enjoying a relaxing bath, or throwing a party. Enjoy The Light For Longer - 50 included lithium batteries last longer than using traditional tea candles. These 80-hour batteries are economical and long-lasting, keeping your space illuminated and beautiful - no matter what. 100% Safe To Use - Anywhere - Enjoy all the benefits of traditional candles and none of the negatives. Zero nasty smoke. Zero clean-up and most importantly, no dangerous exposed flames. These tea lights are the safe, simple answer to decorate with light - from the cosy comforts of your home to your next big adventure. If you have any questions about this product by AceList, contact us by completing and submitting the form below. If you are looking for a specif part number, please include it with your message. CC Home Furnishings Club Pack of 24 Patriotic American Flag Design Luminaria Bags 11"
CC Home Furnishings Club Pack of 24 Jack O'Lantern Design Halloween Luminaria Bags 11"
12 HALLOWEEN Day Of The Dead Party Decoration Prop Paper SKULL LUMINARY BAGS U.S Best Seller!